Get your Cubs100 Centenary Badge now! Centenary Cub badges are available at the National Scout Shop. Badges cost R7.50. They will be available in Scout shops nationwide soon. 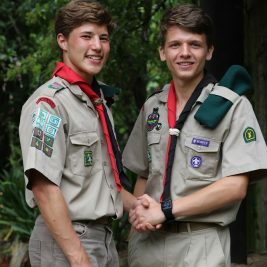 This badge was designed by siblings Ethan and Elowyn Haines from 4th Benoni Air Scouts. Congrats for winning the Cub Centenary badge design competition! The badge will be used on all promotional material as well as be worn as an events badge for the year.